The howl of the wolf can be heard from miles around. It is the trademark by which these very animals are known. A wolf may howl for a variety of reasons but the main one involves being able to identify where the rest of the pack it belongs to happens to be. These howls can also be identified as a way to warn other packs in the area that they are stepping into territory that has already been claimed by another. In order for the howl to be effective, a wolf has to bend the neck upwards and that is where legends such as those that they are howling at the moon come from. With the head lower the howl isn’t effective. This is what allows them to get the high pitched volume. Each wolf has a slightly different sound which is why other pack members know they are being called. The howl is also a way to get the members of the pack worked up and excited about going hunting. They may howl in unison at this point before they go out there to look around. Think about how a sporting team rallies with the coach and makes a shout out before they take their positions. That is the same way with the howl. 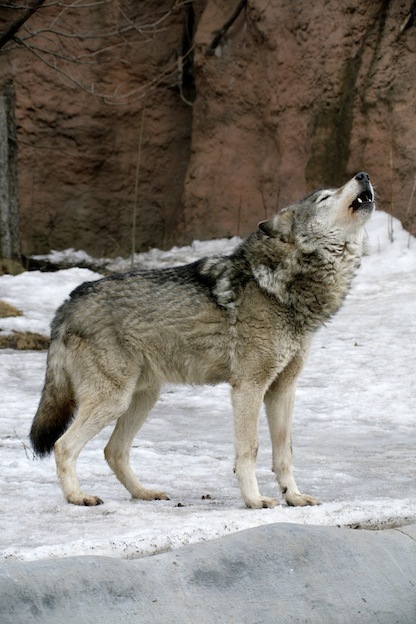 It is rumored that howling wolves during the day means they are rabid. This is not true as you can hear them any time, but night is when they are the most active. You don’t need to be afraid if you hear them though. The howls can be heard for many miles away so they likely aren’t nearly as close to you as they may sound. Barking is another type of vocalization that wolves take part in. Usually this is done within the pack to try to get something in motion. It can be a signal that the pack is in danger so they need to run. It can be a signal that it is time for the pack to move on from a certain area. Sometimes the alpha male will bark to get the attention of one female. It is all part of the structure and organization within the pack. 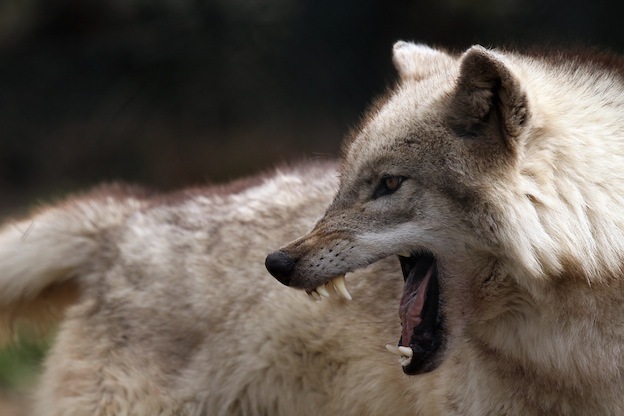 Low growls are often used by the alpha male and the beta female. They are signs to keep the other members of the pack in order. The omega wolf is the lowest ranking one of all in a pack. They will often try to move forward in a group but these growls will remind them of where they rank. Growls is a way for the wolves within a pack to show aggression towards each other. It isn’t very often that they do so. For the most part they get along well. They may hiss at the pups to warn them not to do something or when their behavior is becoming too playful for the overall security of the pack. The older wolves can engage in this type of play with each other for fun, but from the untrained observer these sounds and actions may look like a fight. A combination of calls are used to help keep tabs on pups as well as other members of the pack. They may separate to scout out areas for food. The calls give them a built in way to check in on a regular basis. It also allows those that have found potential food sources to call the other wolves in the pack to come help them. Whining and whimpering are often ways that the younger pups communicate with their parents and other pack members. They are soon taught the more effective types of communication to use though.